The Andhra Pradesh government is giving forests that sustain tribal communities to the Reliance group of industries for plantations. That, too, with the help of joint forest management institutions. The reason may be more than "fund crunch"
a storm is brewing in the southern state of Andhra Pradesh. It is not one that augurs well for a state known for the progress heralded by its computer-friendly and media-savvy chief minister Chandrababu Naidu. The state government is at an advanced stage of signing a memorandum of understanding ( mou ) with the Reliance group of industries for setting up plantations and providing other agro-forestry-related activities in government forest lands. Further, for the first time in the country, institutions under joint forest management ( jfm ) will be used as a medium. It's just that the people of the area know nothing about la affaire Reliance. As a matter of fact, it is a closely-guarded secret; only a privileged few are privy to it. The reason cited for Reliance's entry is "fund crunch that threatens to derail the entire jfm project" in the state. But experts are not willing to buy the rationale. Most of the jfm areas are close to attaining self-sustainability. The average income of the family is as much as Rs 5,637 per month. "So why rely on Reliance?" queries M V Sastri of the Centre for World Solidarity, Hyderabad, which has helped in formation of more than 300 Vana Suraksha Samiti ( vss ), village-level forest user groups that protect and regenerate degraded forests. Besides the debate on jfm finances, this deal has revived a two-decade old debate: should subsidised government land be given to industries for plantations? Is it right to use jfm institutions as facilitators? Expectedly, environmentalists and non-government organisations ( ngos) that are aware of the deal have been creating a stink. They have suggested that farm forestry on private lands would definitely be a better alternative. But the state government is not in a mood to relent. The deal is expected to be sealed by September 2000, the company will launch plantation activities in 10,000 hectares (ha) of land in three districts of the state: Vishakapatnam, Adilabad and Chitoor. But if proved successful, more land will be provided, says Naidu. Money matters Besides contributions from eight organisations, currently the jfm programme in Andhra Pradesh is supported by a Rs 380 crore World Bank fund. Started in 1993, the seven-year programme is due to end this September. "From where are we to get the money to sustain jfm ?" questions S D Mukherjee, the state's principal chief conservator of forests ( pccf ). The jfm project comprises some 7,000 vss units, with an estimated membership of 1.6 million. They are regenerating more than 1.6 million ha of degraded forest lands. The programme has been a success, particularly in the tribal areas. In fact, the three tribal districts of Vishakapatnam, Khammam and Adilabad account for 30 per cent of the regenerating forest land. Moreover, in forests where Naxals are active, jfm is the only government project that has been accepted by the extreme Leftist organisations. Regeneration of forests has meant restoration of the livelihood of tribal communities. The programme is unique for its focus on water conservation and benefit sharing. Watershed development was given primary importance. This helped in the regeneration of natural forests. Defending its decision to invite industries, the forest department has cited that a minimum of 10 years is needed to make vss units sustainable. "The first three years will go in spreading awareness, the next three years in developing linkages and the balance three to four years will help in consolidation and self-sustenance," reads the department's action plan for the coming 20 years. The state has 6.4 million ha of forest land, of which 2 million ha is degraded. "From where will we get money to regenerate all the degraded land?" queries Mukherjee. The government reasoning that there is a resource crunch is just an "excuse", say those opposing the deal. A major part of the World Bank money was used for preliminary infrastructure development and capacity-building. Only 26 per cent of the money sanctioned was actually spent on core forest activities. Given the forest department's action plan, another three to four years is needed to make vss units sustainable. "The nabard (National Bank for Agriculture and Rural Development) funding can take care of that," says V R Sowmitri, coordinator of Andhra Pradesh secretariat of jfm , a body of ngo s implementing the programme. He is referring to the Rs 146 crore loan that the state government has secured for jfm from the bank. According to the state forest department's own assessment, about 3,000 vss units are already on the verge of sustainability. Some 1,500 vss units have become self-sustainable through the revenue from betel leaf collection. According to forest officials, a meagre Rs 4,500 is all that is needed to fund one hectare of land under jfm . Forests are protected by the people voluntarily, and regeneration takes place naturally. So the only cost incurred is on fencing and saplings, for instance. Hence, all the talk about fund crunch sounds hollow, say environmentalists. "We agree that allocation for the forestry sector is minimal. But jfm can be made sustainable by innovative internal resource management. When the government hesitates to hand over forests to the tribal communities, how can they hand it over to the industries?" questions Ravi Pragada, executive director of Samata, a ngo working for tribal rights. "We should rely on the ability of vss units to fund themselves," says Sastri. Interestingly, nabard is the first bank to fund a jfm programme in the country. Informs Naidu, "I am trying to get money from other sources as well. I may also enter into another agreement with the World Bank to protect all the forest areas in the state." "It is a violation of the forest policy and using the jfm institutions is like pushing the much dreaded proposal through the backdoor," says R Rajamani, former secretary to the Union ministry of environment and forests ( mef ). The state government, however, is dogged in its perusal of the deal. " ngo s do not let you do anything. It is just a pilot project," says Mukherjee. "Using jfm as a medium, industries are stepping in as partners. They will invest money in plantations and get some benefits," says Naidu matter of factly. The state government's determination can be gauged from the fact that despite the regional office of mef in Bangalore rejecting the proposal, the forest department went ahead with the proposal. "Our legal cell has clearly studied the proposals, there are no irregularities," avers Mukherjee. With the decision of the Andhra Pradesh government to invite industries ignites the debate on whether industries should be given government forest lands for captive plantations and other commercial uses, particularly because there is an option of procuring the raw materials from farm forestry. A sizeable portion of the rural population is dependent on them for a livelihood. What is feared is the collapse of the state's tribal population's forest-dependent lifestyle. Reliance would be working in three tribal dominated districts. "The first and more important fallout would be monoculture resulting from plantations. This would lead to a breakdown of the life-sustaining flow of minor forest produce," says Sowmitri. However, Naidu assures that "ownership of land will be with the communities, so there is nothing to fear. Also the areas of interest are specified: industry will look after processing, manufacturing and technological aspects, while villagers will oversee cultivation and plantations." Says K V Rajan, project in-charge, Reliance group, "We will go for mixed farming and ensure that the biodiversity of the region is protected. We will not go for monoculture." Adds Mukherjee, "Where is the harm if I use five per cent of the land for plantation." There will be a committee comprising two members from the forest department, two vss units members and two from the industry to decide on the species to be planted. "What else do you want as a safeguard?" asks Mukherjee. However, earlier experiences have not been as transparent as this one is being made out to be. According to Sowmitri, in 1997 the pccf on behalf of the vss signed an agreement with itc Bhadrachalam Paper Boards Limited, making plantations in 5 ha every vss units area compulsory. "Nobody was consulted then," he says. "Once the industries are given a headway, they will manipulate everything," says Rajamani. In the ongoing talks, too, vss units has not been consulted. "This shows that the government has something to hide," says Sowmitri. The problem is that vss units are not legal bodies. They have been formed according to government orders and are not backed by any legal status. "While the vss units are legal non-entities, industries are given all the legal support and protection by the government," says K S Gopal, director of Centre for Environment Concerns, Hyderabad. "Obviously, vss units will be prone to government whims so they cannot do much if industries want to impose their agenda," agrees Sastri. "In the tribal areas we need a good mix of species, not monoculture. It will lead to a problem in food security," says Shivarama Krishna of Sakti, an ngo fighting for tribal rights over forests and lands. The Andhra Pradesh land deal is also the first time in the country that jfm would be used an entry point for industries. According to a high level forest official, the idea of using jfm was a means to bypass the legal hurdles of not allowing private activities in forest lands. Says the official on conditions of anonymity, "The decision came after a long legal deliberation." But Gopal believes it is a ploy to temporarily avoid regulations. "Government will use jfm for the time being and once there is a positive development towards industry involvement, the forest department will come forward with a direct agreement with industries," he says. Adds an optimistic Naidu, "Plantations will protect our environment because we have vast areas of degraded lands. Further, both the people and the industries will derive benefits from the project." According to sources, Reliance had earlier requested for 100,000 ha of land. Despite the chief minister's willingness, the legal cell of the forest department vetoed the request saying that it would lead to a public outcry. Hence, to bypass the legal hurdles and earlier oppositions, the government evolved the novel method of involving jfm institutions to get the project approved. The mou is being finalised separately by the state forest department and Reliance but, says Mukherjee, industries will have direct tie-ups with the vss units for taking up plantations and other forest-related activities. Between vss and Reliance, there will be a three-strata arrangement -- short, medium and long-term -- over 20 years. Not much is known about the long-term plan, but under the short and medium-term arrangements, Reliance is expected to take up medicinal plants and other agroforestry-related activities spanning four-seven years. The company is expected to give 60 per cent of the revenue from short-term activities to vss , while in the medium-term 50 per cent revenue will go to vss . This will be increased to 100 per cent after Reliance recovers its investment costs. However, benefit sharing in long-term plantations and other activities is still unclear. Going by jfm modalities, it is assumed that the company, along with the forest department, will take the major percentage of revenue. Besides, Reliance is also expected to get tax benefits from the investments on the forest lands. According to sources, the mou mentions the benefits to the company and the "sustainable" supply of raw materials for its operations. "For all plants and products, Reliance will have a buy-back agreement with the vss units," says Mukherjee. "Profit has to be there for the industry. Otherwise, why should they invest?" he questions. Moreover, the mou also mentions Reliance can withdraw from the project at any stage if it does not find the investment profitable. Besides Reliance, the Naidu government is contemplating on providing land to the Murugappa group of industries for neem plantations and itc Bhadrachalam Paper Boards for eucalyptus plantations. In fact, itc Bhadrachalam has already been provided 300 ha of land in Khammam district. Moreover, it has already entered into an agreement with the state government for a programme to plant 2.5 million high-yielding eucalyptus trees in 1,500 ha of degraded forest lands every year throughout the state. The Reliance controversy comes at a time when the state government is being attacked for another land deal. 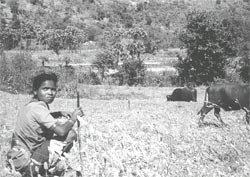 The state government was trying to amend its own Land Transfer Regulation Act of 1970, which prohibits transfer of land to non-tribals in specified areas. The amendment was sought to help a Dubai-based aluminium company to mine bauxite in the Srikakzlam forest, a part of the fragile Eastern Ghats. Being a Fifth Scheduled area, no tribal land should be transferred to any non-tribal except a government body or a tribal cooperative. Even the Supreme Court ruled against any transfer of land in these areas. But the government was trying to push through the amendment. However, protests from ngo s, human rights activists and opposition parties forced the government to declare that it does not have any intention to amend it. Interestingly, the land given to Reliance is a scheduled area. Technically, the government cannot give it to a private party. The doubt in many minds is this the reason for the government using jfm bodies as facilitators.